September was especially beautiful at the beach this year. It stayed warm much longer than usual. The surf was often very rough because of the hurricanes brewing far from shore. Here are three watercolors I painted from photos taken last month. And I took a ton more photos to last me through the winter! These three September paintings are now available for sale as prints on watercolor paper or gallery wrapped canvas. Click here to visit my online shop. All of the prints in my shop are available on watercolor paper or gallery wrapped canvas! Categories: Online Shop, painting the beach, Uncategorized, Watercolor | Tags: Beach art, beach house art, canvas prints, coastal art, Coastal design, coastal interiors, coastal living, Seascapes | Permalink. I paint in watercolor and have only dabbled with acrylics on canvas. Seeing one of my watercolors blown up and printed on canvas is really exciting. It adds another layer of interest to the painting. A few steps away you see the ocean and the waves. When you step closer you see the brushstrokes. The design of my home is, not surprisingly, very beachy. So this canvas, Blue Wave #11, fits right in. Next up to select a few of my square ocean paintings, have them printed on canvas, and hang them side by side. All the paintings in my shop are available as Giclee art prints on gallery wrapped canvas. Take a look at shop.eileenmckenna.com. Categories: Online Shop | Tags: Beach art, Beach canvas, Beachy decor, coastal art, Coastal design, Coastal home, Coastal interior, Ocean canvas, Ocean painting, Seascapes, Wave canvas, Wave painting | Permalink. I’ve added six new paintings to my online shop! Four of the paintings are “The Green Collection.” You may remember that in August I launched my shop with “The Blue Collection.” Grouping the paintings by the color of the ocean made perfect sense to me when the giclee printer suggested it. Something that has always fascinated me about the ocean, is how the same water, in the same place, can be different colors at different times. The Green Collection is the second set of watercolor paintings I’ve released as Limited Edition Giclee Art Prints. Click here to visit my online shop. Categories: Online Shop, painting the beach, Watercolor | Tags: Beach art, beach paintings, giclee prints, ocean, Seascapes, watercolor paintings, Waves | Permalink. The focus of this painting is the rocks – the jetty. I had fun creating the different shapes and shadows of the rocks. I’m especially proud of the wet look of the sand where the water has just receded. And of course this painting needed a seagull. The beaches in my hometown are delineated by the jetties. They are an unmistakable characteristic of our beaches. So it seemed appropriate to have them be the star of a painting. “Jetty” is part of “the Blue Collection” and is available as a Limited Edition Giclee Art Print in my online shop! Categories: Online Shop, painting the beach, Watercolor | Tags: Art prints, beach, Beach art, beach painting, giclee prints, Jetty, Ocean painting, rocks, seagull, watercolor | Permalink. I primarily paint from my own photos. It’s nice to incorporate that into the process of a painting – capturing a moment that strikes me and later painting it. This painting is from a photo I took at my hometown beach of Long Beach, NY. It’s taken from the angle of one set of jetties, looking towards the next set – the “side.” What I love about this painting is how much it reminds me of Long Beach – the jetty, the color of the water, the surfer, the waves, even the familiar angle – as you cross over the rocks and step onto the next beach. “Side Surfer” is part of “the Blue Collection” and is available as a Limited Edition Giclee Art Print in my online shop! Categories: Online Shop, painting the beach, Watercolor | Tags: Art prints, Beach art, beach landscape, beach painting, giclee prints, Ocean painting, painting the beach, surfer, Surfing, watercolor, Waves | Permalink. This painting was a break through for me. It was the first painting where I used white gouache – more opaque than watercolor paint – to paint the foam and spray. Before this I relied on the white of the paper for those areas. Using gouache allowed me to create more depth in the foam and waves. When I polled family and friends on which of my paintings I should make available as prints, everyone had #11 on their list. (#11 was the number I’d assigned to it.) It was written so often, it became #11 in my mind, so it seemed fitting to call it Blue Wave #11. When I posted Blue Wave #11, I got such a great response! Comments included, “I can smell the salty air of the ocean” and “Soothing, as if I can almost hear the wave breaking.” It’s gratifying to feel you’ve made a breakthrough and then also have people respond to positively. “Blue Wave #11” is part of “the Blue Collection” and is available as a Limited Edition Giclee Art Print in my online shop! Categories: Online Shop, painting the beach, Watercolor | Tags: Beach art, beach landscape, beach painting, Blue Wave #11, giclee prints, Ocean painting, surf, The Blue collection, watercolor, Wave paintings, Waves | Permalink. “Waiting” is part of “the Blue Collection” and is available as a Limited Edition Giclee Art Print in my online shop! Categories: Online Shop, painting the beach, Watercolor | Tags: Beach art, beach landscapes, giclee prints, ocean, surfer art, Surfing, The Blue collection, Waiting, watercolor, Waves | Permalink. The Blue Collection is the first set of watercolor paintings I released as prints. 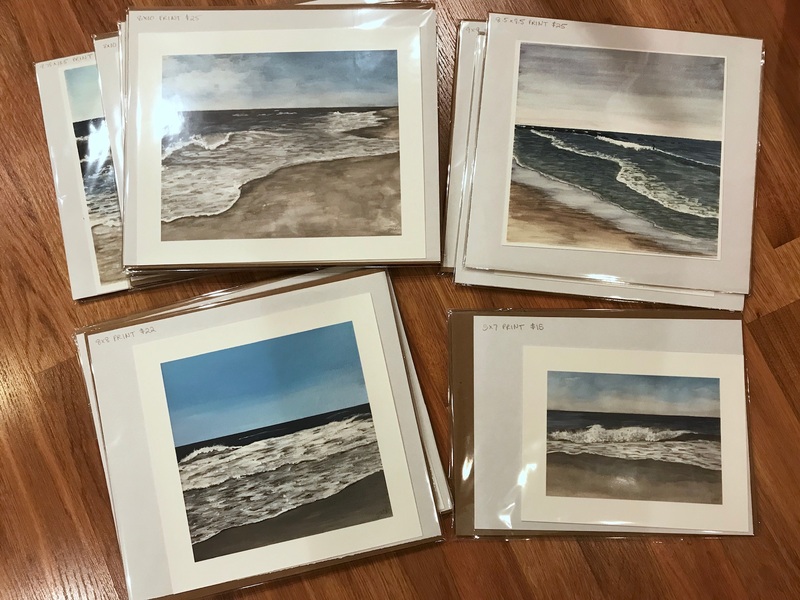 When I first showed the giclee printer my favorite watercolor paintings she sorted them and pointed out that in these four, the water is shades of blue, while in others it is green. I immediately saw it too, and so the Blue Collection was born. One of the things that amazes me about the ocean is that the water can be different colors on different days. The Blue Collection is available as a Limited Edition Giclee Art Print in my online shop! Categories: Online Shop, painting the beach, Watercolor | Tags: Art prints, Beach art, beach landscapes, Beach lover, beach paintings, giclee prints, ocean landscapes, watercolor paintings | Permalink.